He was born in 1964 in the village of Dingilhewa in Licê (Lice), Amed (Diyarbakır). He has been writing since 1996. 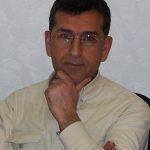 His pieces and articles have been published in a number of Kurdish and Turkish newspapers and magazines. He has published twenty-three of his works, including nine translations. He has written fourteen books, including four short story collections, a book of poetry, two dictionaries, two grammar books, a compilation of literature, a compilation of folktales, a book of articles, a book of essays, and a book of scholarly research; the rest are books he translated from Turkish and Persian into Kurdish as well as between the different dialects of Kurdish. He has edited and proofread dozens of books in the Zazakî and Kurmanjî dialects of Kurdish published by various publishing houses. Currently, he is a proofreader and editor of Newepel (The New Page), the first newspaper in the Zazakî dialect of Kurdish. He is also the publisher of Şewçila, a literature and art magazine in the Zazakî dialect of Kurdish. In addition, since 2009, he has been the editor of the internet site www.zazaki.net, which publishes mainly in the Zazakî dialect of Kurdish.